Hearing loop systems or T loops, are an established technology that helps the hearing impaired to increase the clarity of amplified sound in any busy environment by working in conjunction with their own hearing aids. 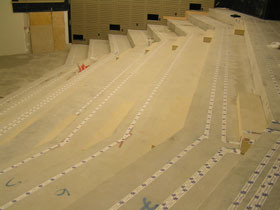 Their installation requires careful co-ordination with other trades, especially flooring, and thorough testing to ensure there is no damage to the loop on completion. ComSec has experience installing loops in a variety of settings, including sites with greater complexity.